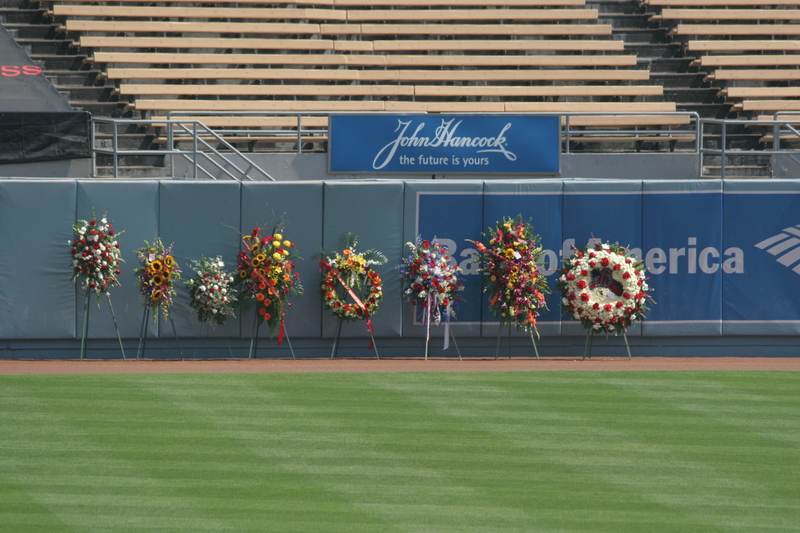 Thank you to the Dodgers, Frank and Jamie McCourt, for opening up Dodger Stadium to the thousands of firefighters (local, from New York, and all over), law enforcement, officials, friend and family, and the general public for the use of a memorial service for Fire Captain Tedmund Hall and Firefighter Specialist Arnaldo Quinones. Here’s a quick recap, in case you haven’t been following the news or you didn’t hear about it. August 26 – The Station Fire broke out. 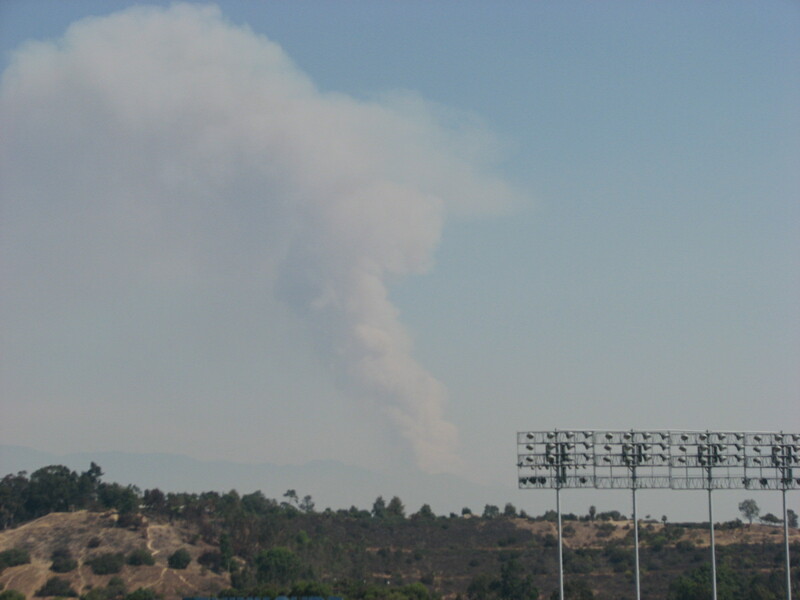 I don’t remember when it broke out or seeing the smoke on this day. I do remember the smoke from the other fire … but not this one. 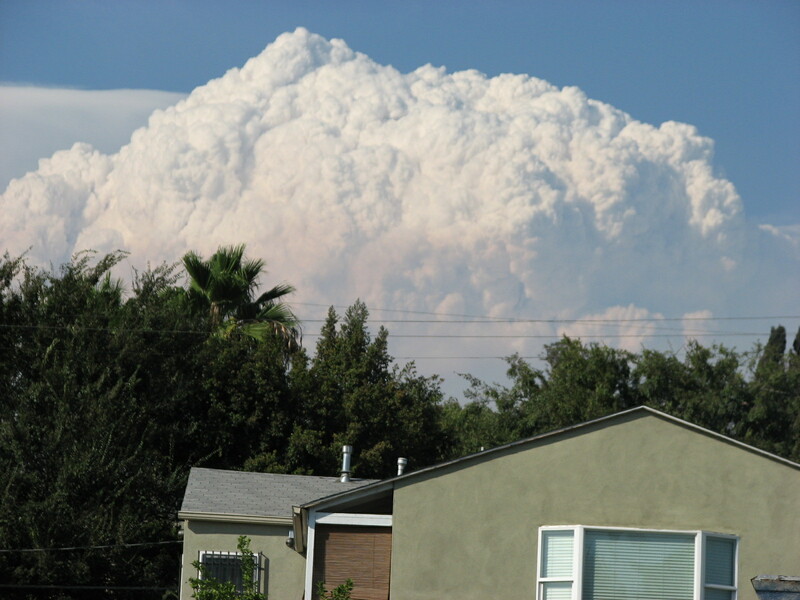 August 30 – The mushroom cloud looks almost like something you’d see from a volcanic eruption. This is taken from outside a coffee house in Los Feliz/Silverlake area. 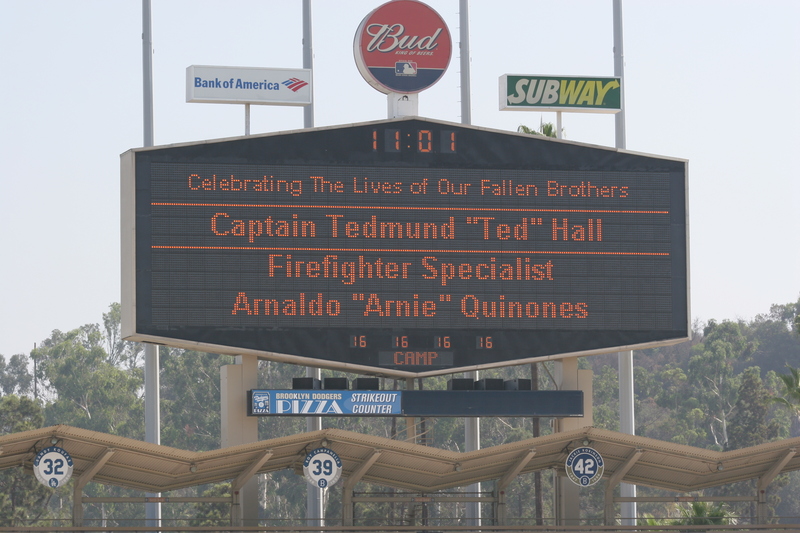 It was also on this day that Fire Captain Ted Hall and Firefighter Specialist Arnie Quinones were killed. I remember hearing about it and was deeply saddened. I was also worried because I have a friend who’s a firefighter and I didn’t know if he was involved in this fire or not. The smoke and heat was pretty bad the first week. On Saturday, I was driving into Pasadena and the “outside temperature” on my car said it was 109 outside. I know it’s usually off by two or three degrees. Even then that meant it was about 106 degrees outside! 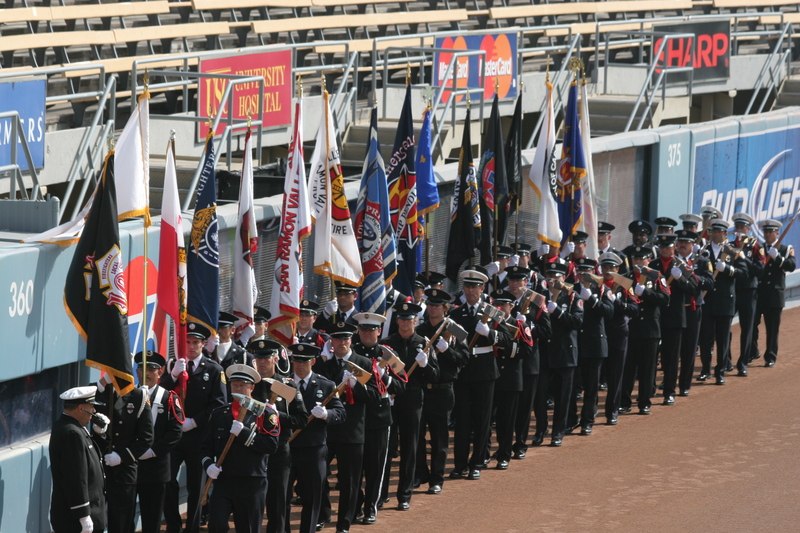 Today was the memorial service for the two fallen firefighters. It was beautiful service. Unfortunately, I arrived a little late. First thing I saw when I walked in was all the fire trucks and engines lined up. 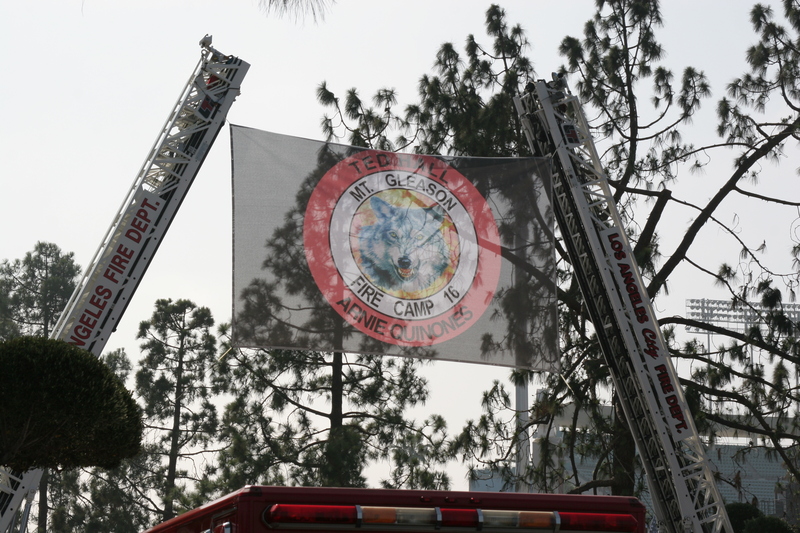 There were two with their ladders raised and a Camp 16 flag was hung between them. Here’s a link to a page the explains the different fire camps. And here’s a link to a page with a little more insight about Camp 16 and the two fallen heroes. The second link includes photos of the site with photos from before and after. 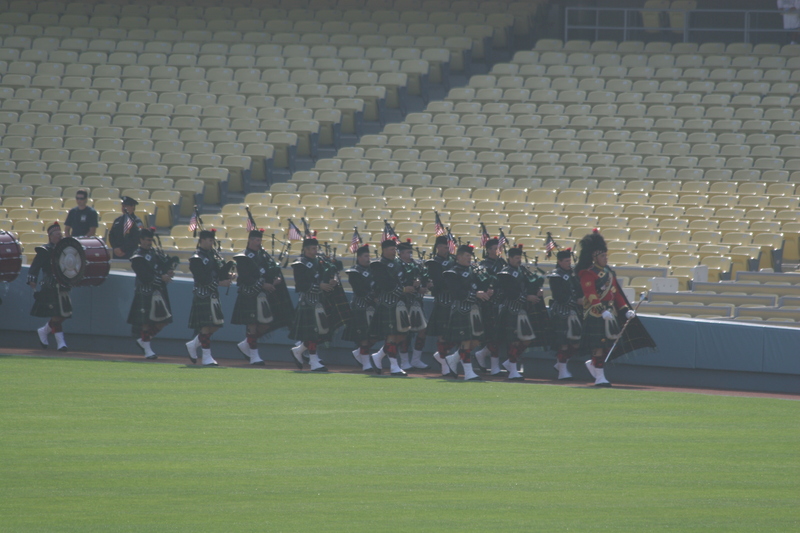 However, I did get there in time for the presentation of the colorguard… (I’ll have to get my program to get the right term in there. I left it at my friend’s house). beautiful.. They had the fire chaplain open up with prayer. 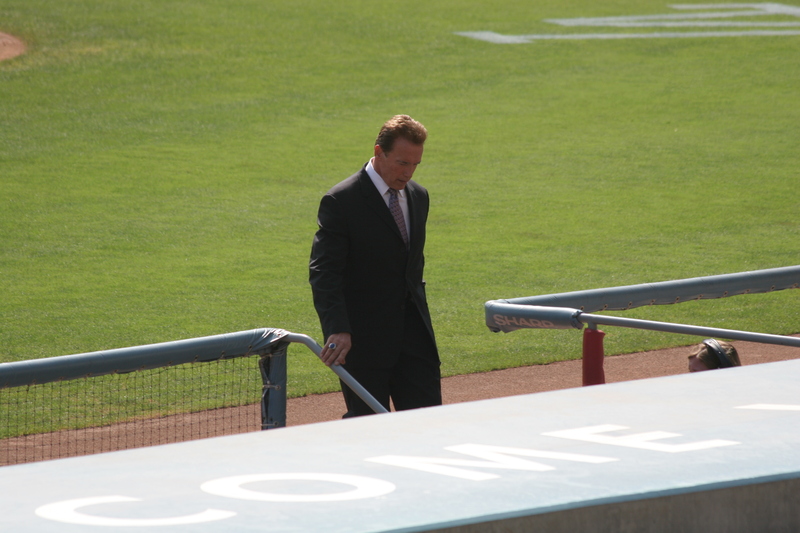 Sorry, I couldn’t get a good photo of our governor while he was at the podium. I was sitting in the last row, since I got there late. I didn’t want to disturb anyone around me. So, I stayed put. 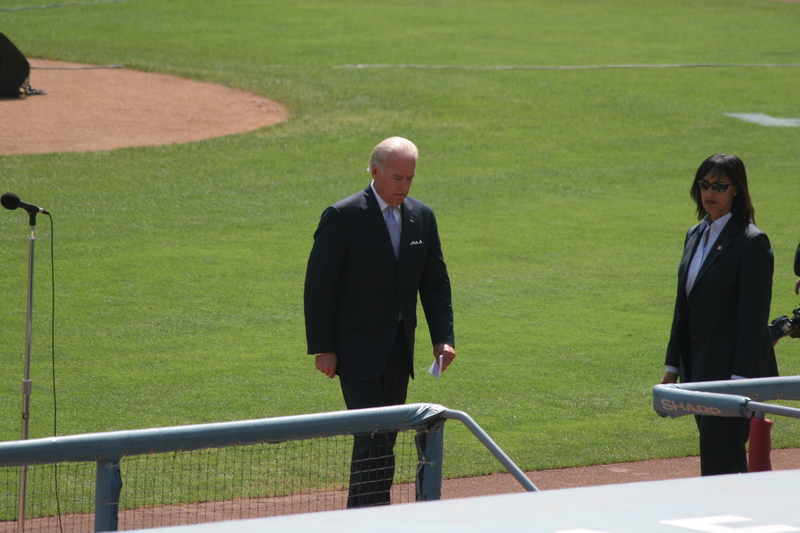 The last of the guest speakers was Vice President Biden. After Vice President Biden’s speech, there was a beautiful rendition of “You Raise Me Up”. It wasn’t the Josh Groban version, but the other version where there’s a second verse (I’ve heard it done by Secret Garden, as well as Selah). Since I had a previous engagement, I had to leave after that. But not before I snapped a few more photos. 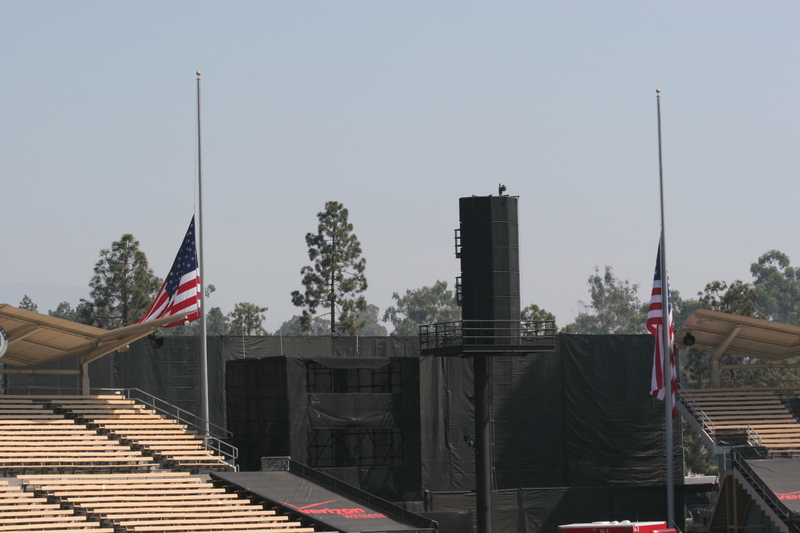 Like the flags flying at half-mast. 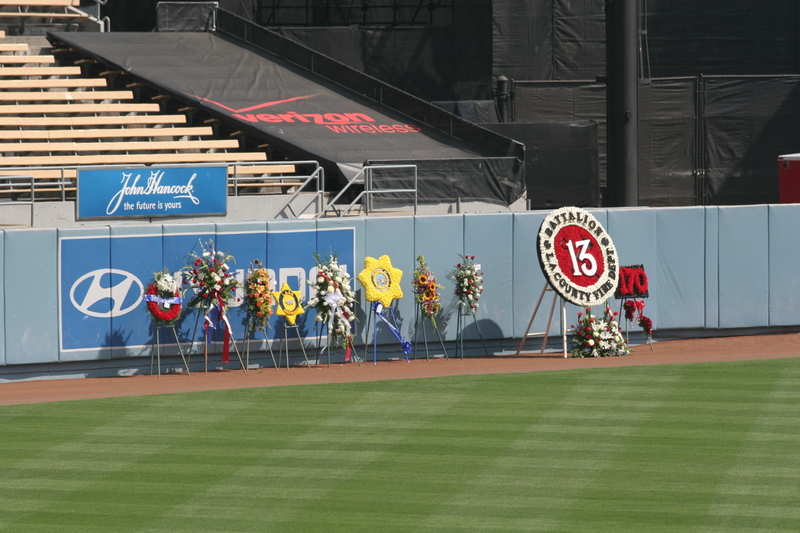 I wanted to get a shot of the giant flag at the fire station by Dodger Stadium, but didn’t have time to stop there. Actually, not sure if I could have. 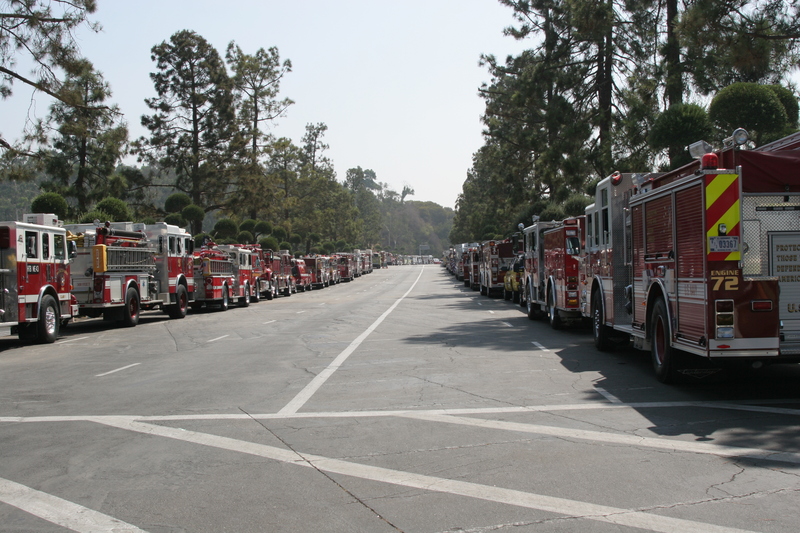 I had to get a picture of the fire trucks and engines all lined up before I left. 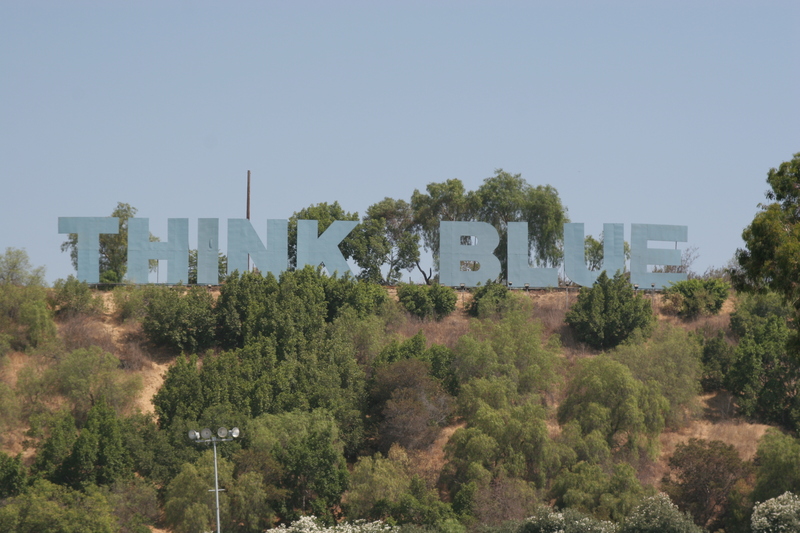 As always, Think Blue. And as our governor says, remember the thousands of firefighters who risk their lives for ours. Every day. Right now. Everywhere.